A diagram of a lindane molecule. 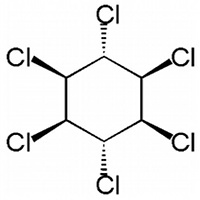 Lindane is a chlorine-based insecticide used for pets, livestock, and various crops. Itâ€™s also used as a wood preservative and as a treatment for headlice and scabies. In humans, lindane has been found to damage the nervous system, kidneys, and liver. Itâ€™s believed to be a cancer-causing carcinogen and an endocrine disruptor. Lindane is banned in over 50 countries and is heavily regulated by both the United States Environmental Protection Agency and the Food and Drug Administration. Symptoms of short-term exposure include high body temperature and pulmonary edema. Long-term exposure may result in convulsions, cancer, or death.